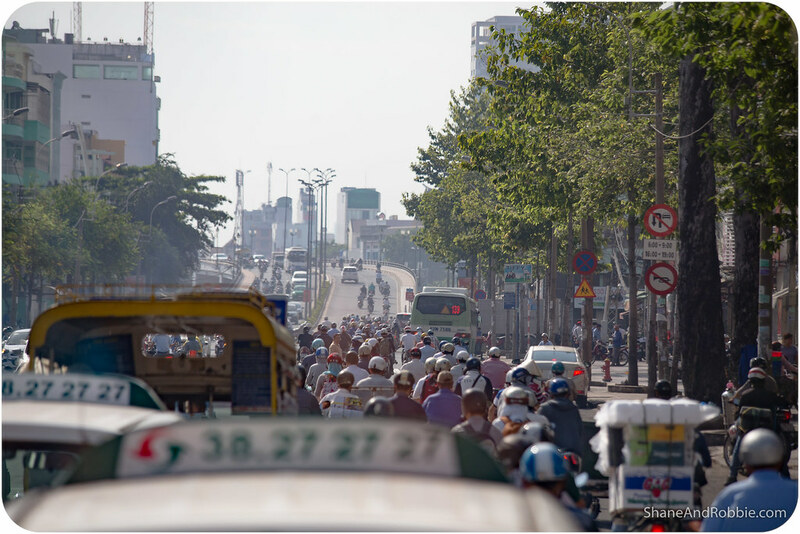 With over 9 million people crowding the streets of Ho Chi Minh City (i.e. Saigon), there’s a certain amount of chaos to be expected. Most of this chaos comes in the form of motorbikes and scooters. Like everywhere we’ve been in Vietnam, motorbikes rule the roads here – there are literally millions of them; and they don’t obey any road rules (at least not any road rules that we can figure out). Crossing the road here is, therefore, quite an adventure. We only arrived in Saigon today but luckily we’ve had a fair bit of practice crossing the streets of Vietnam*, so the traffic didn’t deter us from exploring District 1, the heart of the city. 1. Don’t wait for a gap in the traffic. There won’t be one. Ever. Even at 2:00am the stream of motorbikes and scooters will be incessant. 2. Expect the unexpected. Road rules are for chumps it seems so don’t expect the traffic in Vietnam to behave as it would at home. Consequentially you will need to make sure to look BOTH ways on BOTH sides of the road; watch out for motorbikes on the pavement; and remember that “Pedestrian Only” isn’t a concept that’s very popular here. 3. Be brave and just go. Pick a less dense patch of traffic, stand tall and walk. Motorbike riders here are like animals of the Serengeti – they smell fear and will destroy you if you show even the slightest hint of it. 4. Pick your target on the other side of the road and move towards it calmly but confidently in a straight line. NEVER turn back or try and change your course. The motorbikes will work around you as long as you stay committed to your path. 5. Watch out for taxis and buses. They WON’T work around you and don’t seem to stop for anyone or anything. 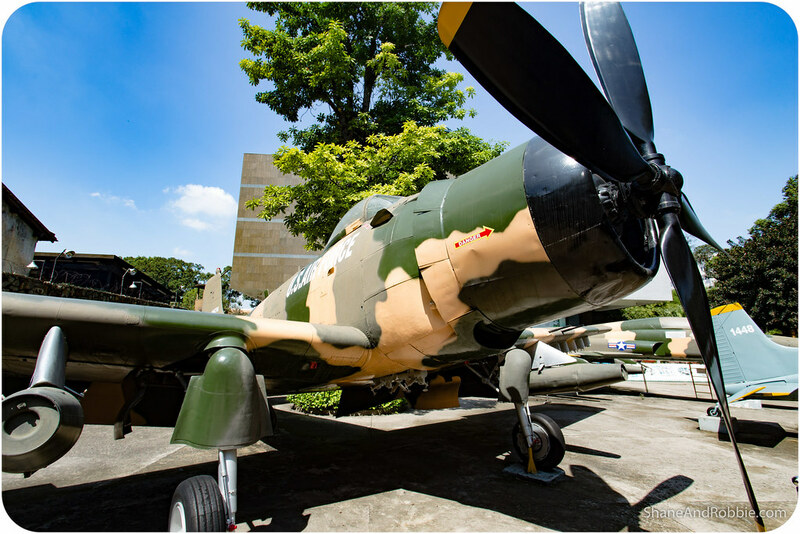 We arrived in Saigon around lunchtime after an uneventful morning flight from Hoi An. 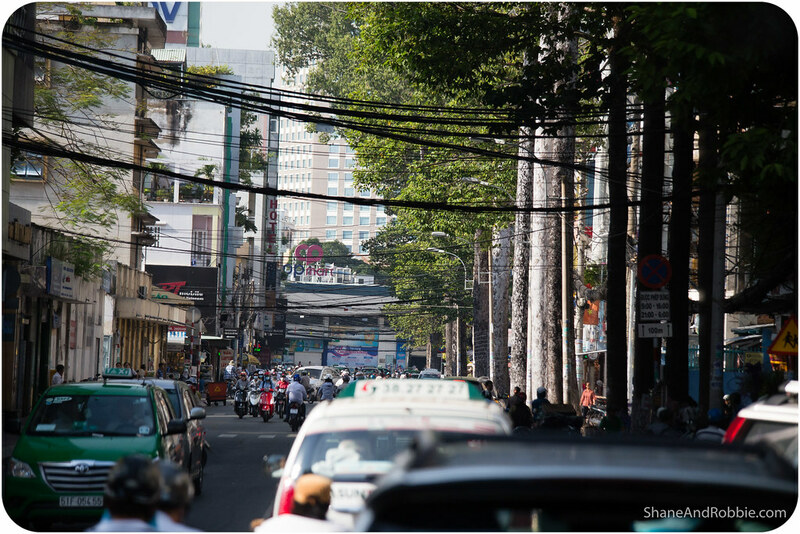 It was a short drive from Tan Son Nhat Airport to our hotel in District 1, the heart of the city, and soon we were out and about in the streets of Vietnam’s biggest city, checking out the sights. 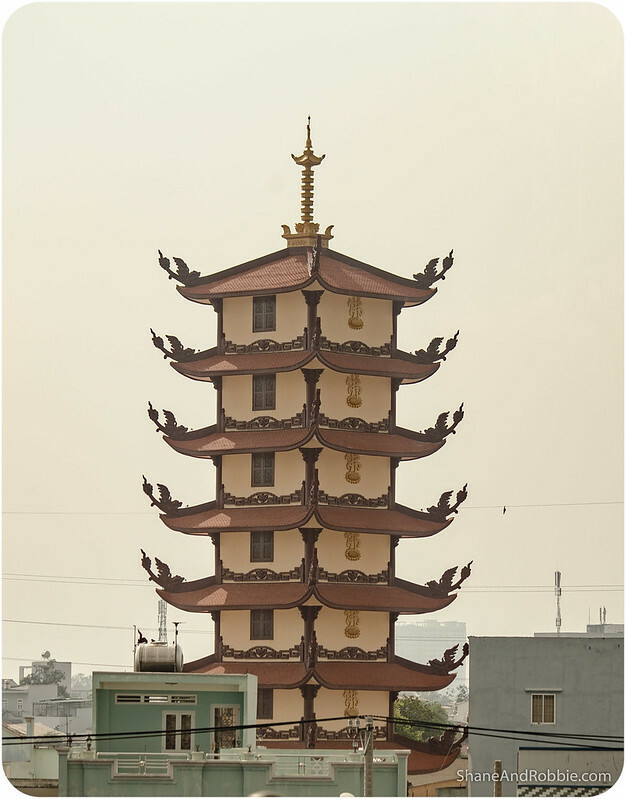 Ho Chi Minh City was known as Saigon in the centuries prior to 1975, when the Communist forces of the Viet Cong took the city and renamed it in honour of Ho Chi Minh, Vietnam’s venerated 20th century national hero. 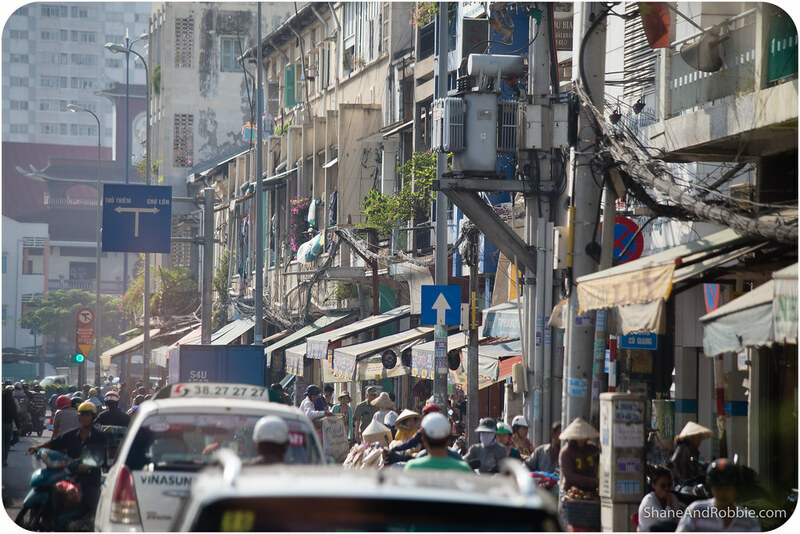 Many of the locals still call it Saigon though, so we’re sticking with its traditional name too. The city is divided into districts that radiate our from the historical centre, which is where we’re staying. 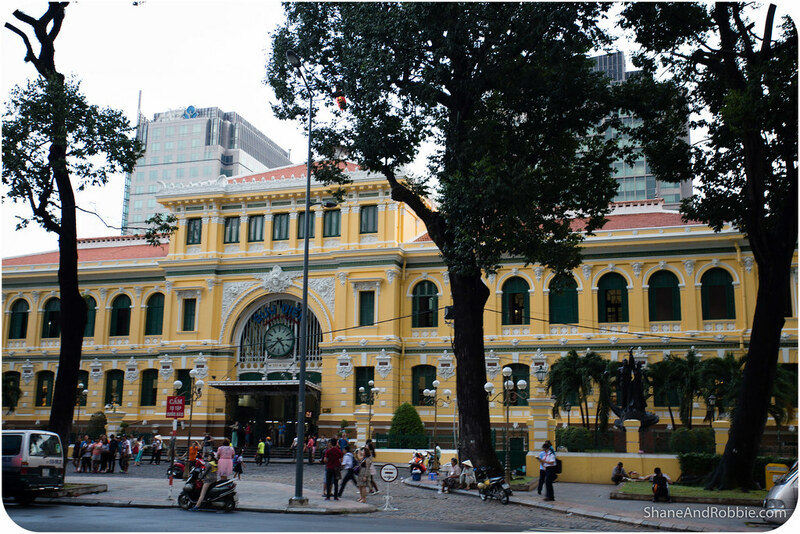 Most of the tourist sights in Saigon are clustered around this area and they’re all pretty easy to access on foot, which is exactly what we did. 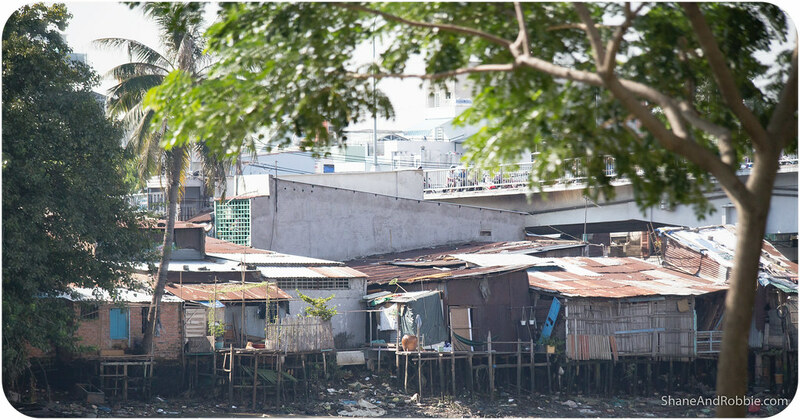 The French colonial influence is still very obvious here, with wide elegant boulevards and historic French colonial buildings mixed in with modern skyscrapers and the rest of the urban sprawl. 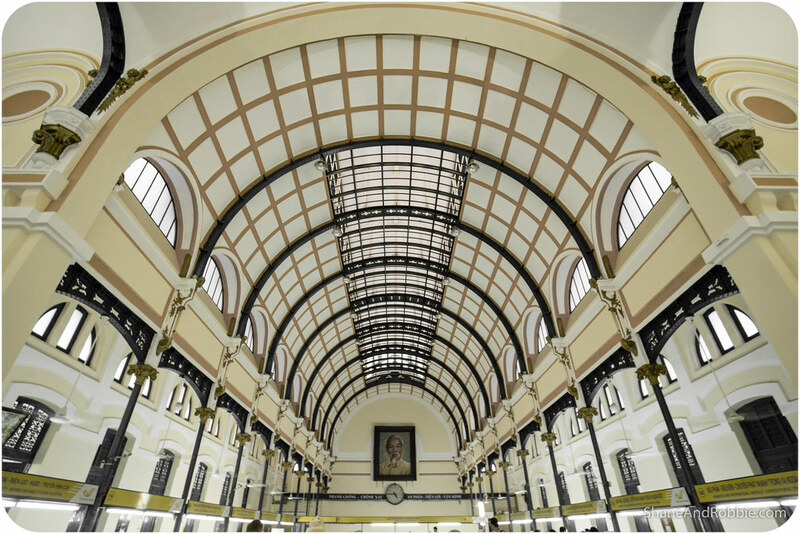 One of the city’s grandest French colonial buildings is the Central Post Office. Construction on this Renaissance building finished in 1891, and it has been a functioning post office ever since. Its ornate furnishings, gorgeous tiled floor, and massively high ceilings are all quite beautiful, but to us the buildings just seems out of place in the midst of this hot, humid Asian city. 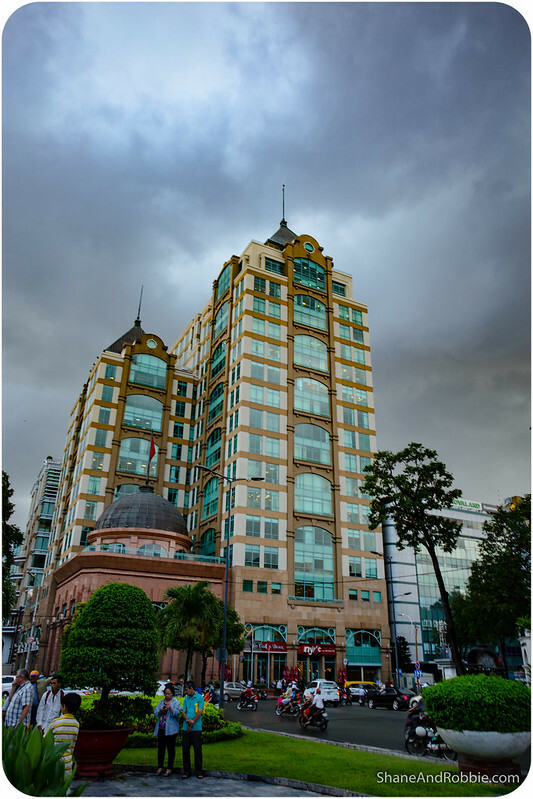 Even more out of place is Saigon’s Basilica de Notre Dame, which stands just across the road from the General Post Office. 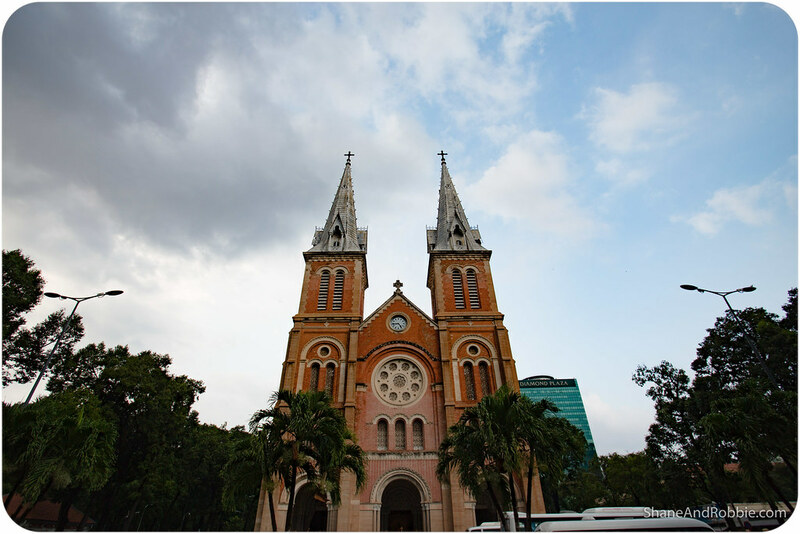 This Catholic cathedral was built in the late 19th century from materials imported from France and is the largest Christian church in Vietnam*. 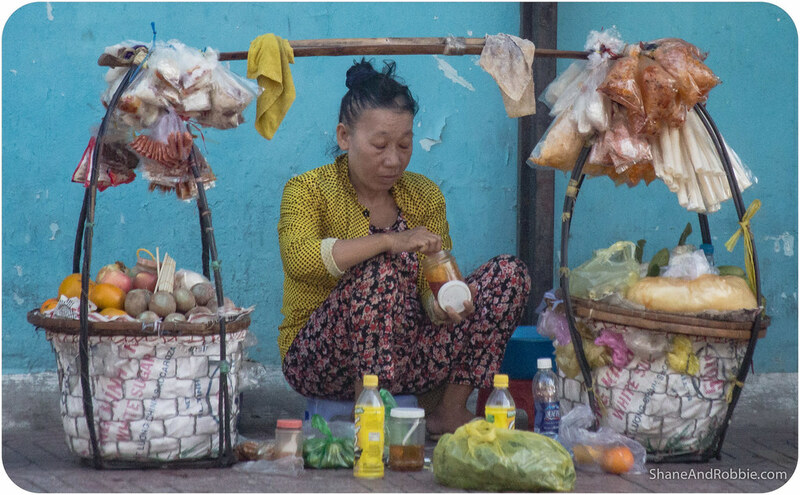 *The French influence continues to be felt in some ways here in Vietnam, with about 6% of the population still adhering to the Catholic faith brought here during the 100 or so years Vietnam was a colony. Mahayana Buddhism continues to be the dominant faith however, with animism/ancestor worship a close second. 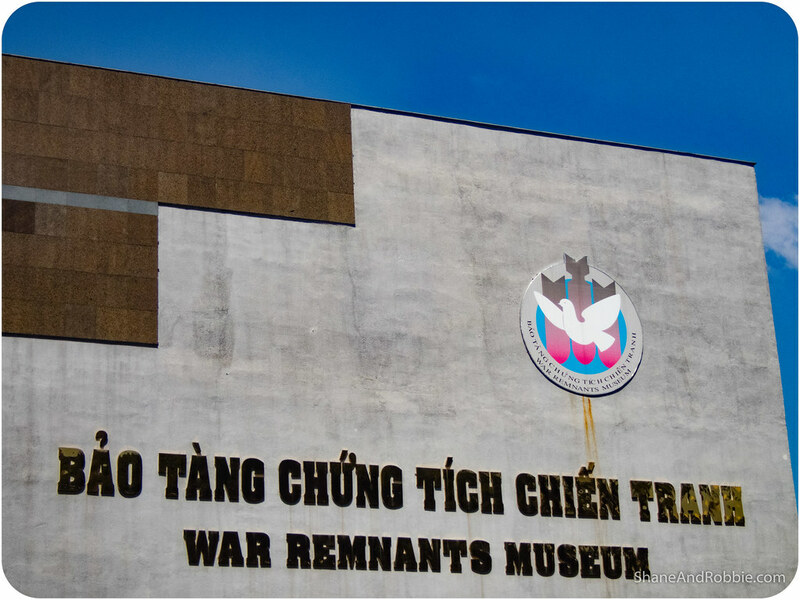 Not far from the cathedral is the War Remnants Museum, which catalogues the deleterious effects of the Vietnam War (known as the American War around here) on the Vietnamese people. The museum showcases hundreds of photos taken during the 20 years of American* involvement in Vietnam, many of them truly harrowing. 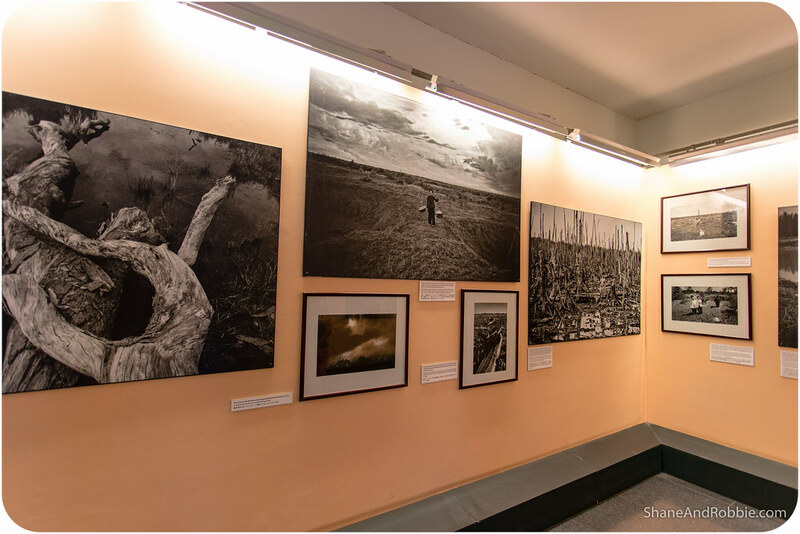 There were extensive discussion and lots of photos documenting the detrimental long term effects of Agent Orange and Napalm, as well as war atrocities such as the My Lai massacre. There were also some rather gruesome displays of preserved foetuses in jars whose devastating deformities were caused by maternal exposure to Agent Orange. Vietnam may have defeated the Western forces, but that victory certainly came at quite a price. *Though the majority of foreign forces involved in the conflict in Vietnam were American, there were actually service men from various Western countries involved (including Australia and New Zealand). 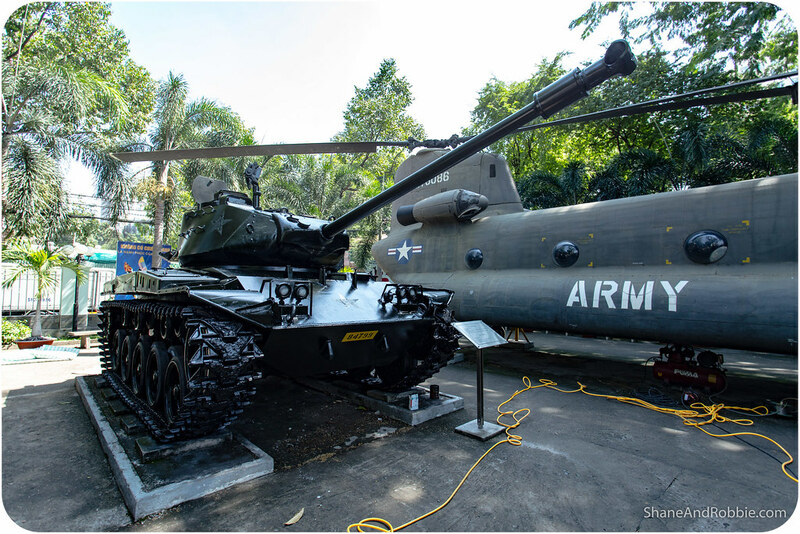 Outside the building there were a range of American military tanks and planes, most of which were abandoned when the Western forces withdrew. 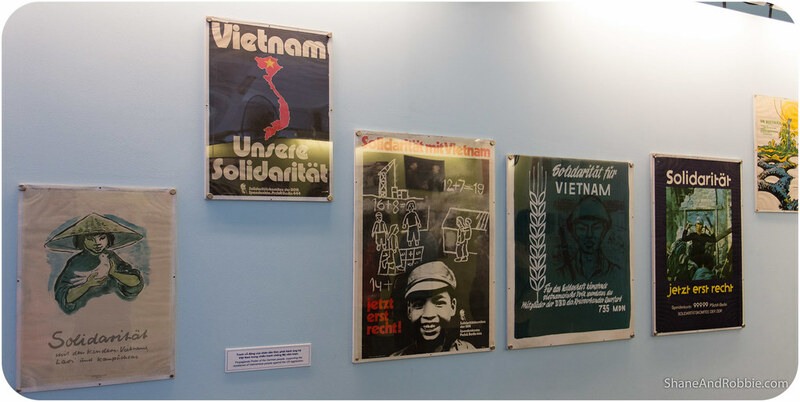 Here the information boards pointed out how the Viet Cong were so much smarter than their foes, and how the Vietnamese won despite how much better armed the Western forces were. Whilst there’s no question that atrocities were committed during the Vietnam War, we were quite surprised at how one-sided the explanations were. 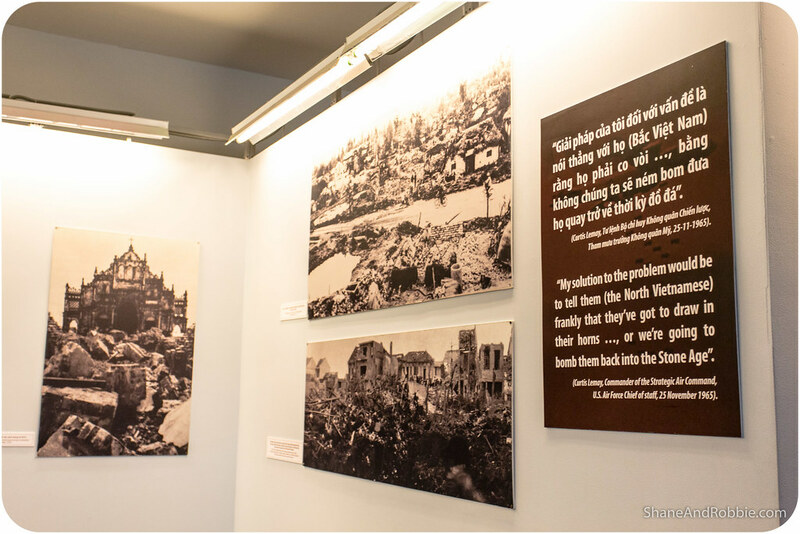 There was no attempt made to present both sides of the story, or portray how tragic war can be for ALL involved; there was just A LOT of pro-Vietnamese Communist party propaganda and anti-American/Western rhetoric. Still, the museum certainly does a good job of demonstrating the appalling legacy of war. 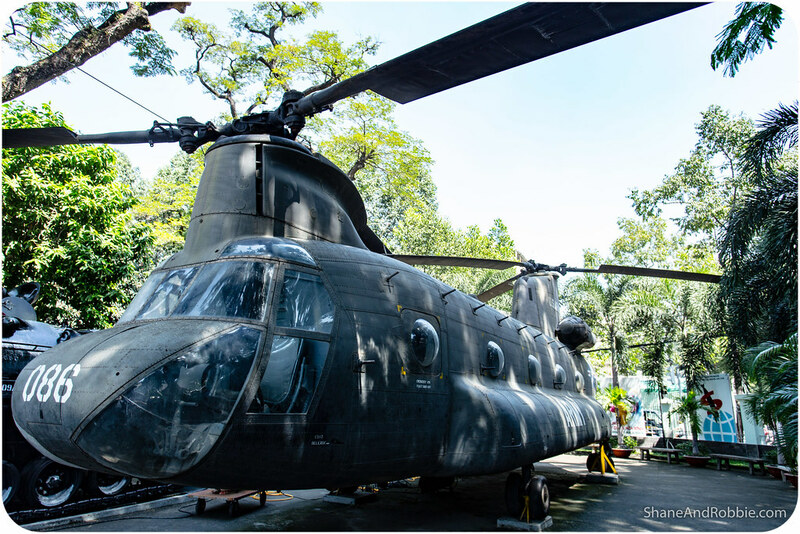 The War Remnants Museum was a sombre way to end our afternoon of sightseeing, and left us pondering the similarities between the involvement of Western forces during the war in Vietnam and the current war in the Middle East. There does seem to be a seemingly inevitable tendency for human beings to repeat history. For us it’s one of the reasons we think travel is so important – not just for ourselves, but for everyone. Travelling and meeting people from different countries, cultures, and creeds does a lot to break down prejudices and hatred born of ignorance. One of the greatest lessons we’ve learned from all our travels is how, for all our differences, people are so much the same (as they’re so fond of saying here in Asia: all same same, but different). The more people realise this, the less likely we are to repeat the sorts of tragedies seen during the Vietnam War.